German Technical Death Metal band DEADBORN formed in 2002. The band has an EP ("Decades of Decapitation" 2004) and two albums ("Stigma Eternal" 2007 & "Mayhem Maniac Machine" 2012) to its' credit in addition to its newest release, the album "Dogma Anti-God" (2018). "Dogma Anti-God" starts out HEAVY. The opening track, "Veneration," begins with classic-sounding Blackened Death Metal overtones that I liked immediately. With the addition of guttural vocals (provided by Mario Petrovic), brutal guitar riffs, an intense bass-line and rapid-fire percussion, the song gets even better. Its fast pace moves along at breakneck-speed without sacrificing any of the track's heaviness making it an excellent song. "Sense of Delight" features shades of old school SLAYER and SEPULTURA as it starts; it sounds like a song from the mid-1980s when both of those bands were much younger and had a raw edge to their music. The guitars are super fast as they join the intense percussion created by drummer Slawek and the equally intense vocal performance by Petrovic. Rage and brutality are balanced with tempo and timing, resulting in a sound that is a joy to listen to. As an added bonus there is a great guitar solo; unfortunately, I don't know which guitarist to give the credit to. I could continue track by track as I normally do. However, as I glance at the notes I took while listening to the album I notice one thing over and over again. I wrote that every single song was either "Great" or "Excellent". So, rather than being repetitive, I'll simply give you an honest assessment of the remaining six tracks on "Dogma Anti-God". Although I tried my best to find a fault with them- just ONE major flaw, mind you -I couldn't do it. "Canine Devotion" and "Dogma Anti-God" are both fine examples of Technical Death Metal that any serious fan would approve of. "Abortive Interment" is a masterpiece with some of the best guitar riffs on the entire album that could easily trigger the Richter Scale if played at the right volume. (Well, that's my theory anyway, haha.) But, in all seriousness, both Jo Morath and Kevin Olasz are fine guitarists who would make any band proud to have them. Nor can the contributions of bassist Guilio Rimoli be ignored as he provides just the right touch to each song. Even the remaining four tracks are GREAT. There isn't a loser in the bunch. If I had to choose only one to recommend it would be difficult. However… "Your Symbol Burns" is my pick, although "Heretic Torment" is pretty good, too. Not to mention "Zero Moment of Truth", which is an instrumental, and the closing track "Prayer In Exigence". 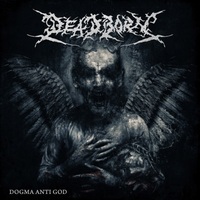 Do I recommend "Dogma Anti-God" for your Technical Death Metal (or even plain Death Metal) collection? Yes. It's one of those well-crafted albums that you can't help liking; or at least I couldn't.